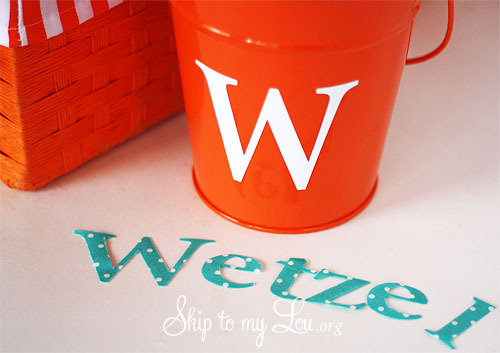 It is so easy to personalize it with the Silhouette Cameo! I used the Cameo to make some personalized gifts for our teacher! It is super simple to do. 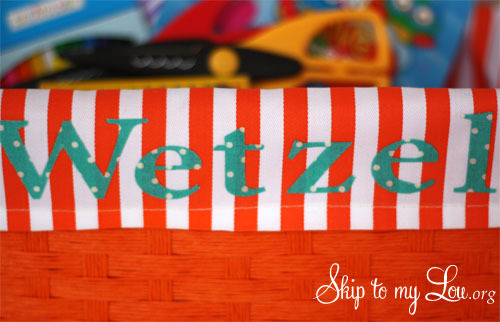 Gather items to be personalized. We used a fabric lined basket and metal pail. The Silhouette vinyl works great on metal, plastic and wood. 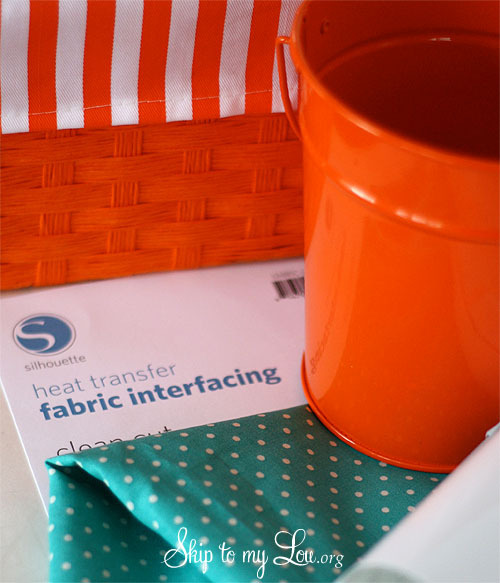 The Silhouette Fusible Interfacing is great for fabric! Size fonts from your computer in the Silhouette Studio to fit the area you want monogramed and then cut! Stick the vinyl to the hard sufaces and iron the letters to fabric. Think of all the things you can personalize for your teacher. I am very imprest by this generous giveway. Thank you for this greate chance. I would love to win a cameo for my classroom! Your web page alone gives such amazing ideas not just for home but easily adaptable for classroom use. Thank you for the info Cindy! Off I go to Michael's. I love my Cameo! Can I ask where you found the pail and basket? 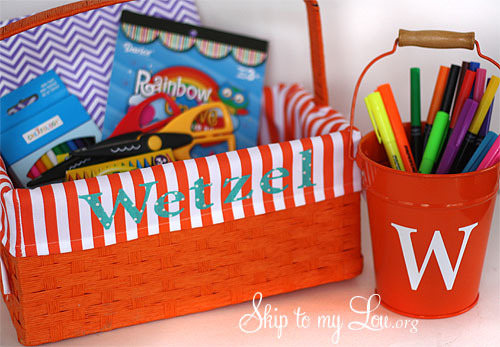 These would be perfect for teacher appreciation gifts! Hi Vicki, I got the pail and basket at Michael's Arts & Crafts. Has a winner been chosen? I can't find it anywhere. Yes the winner is in the rafflecopter widget. I want to make 150 tshirt transfers to give away in the 'riding lawnmower 4th of July Parade.' If I don't win, I need to start cutting them out today!!! :-) Ms.jesashek is my daughter's favorite teacher... she's hoping I'm not too late either. It says the giveaway is over. :( I would have liked to enter. Would SO love to win! I've been drooling over all of the cute things that the Silhouette can make on their fb page for a while, but it just hasn't been in the budget! Thanks for the giveaway! This would be a great gift for any teacher- Thanks for the offer! Oh my...what a wonderful giveaway. I come from a very small rural town and to be able to gift a machine like this to my Grandson's Kindergarten teacher would be an amazing thing to do! My daughter went to Kindergarten in the very same classroom and most of her former teachers are now teaching the next generation. It would be so cool to be able to present these hard working teachers with such an amazing tool to share! I know a teacher of special children who SOOOOOO deserves this! Need this for myself and my daughter needs is for teaching here 6th graders. What an awesome giveaway! This would be perfect for my daughter who is a kindergarten teacher in a small Montana community. And her mom would have so much fun with one too! Thanks for the chance to win! My neighbor and good friend is a special ed teacher and would love to have here receive this great give away!!! What a great giveaway! This would be perfect for the teachers at my son's school! Oooooh! What fun this would be!! So many projects, so little time! My favorite first grade teacher would be ALL over this! I would be so happy to win one!! It can be an early birthday gift!! Thank you for the opportunity. My favorite teacher would be my sons Kindergarten teacher Mrs. Spencer!! As a teacher and crafter myself, I've been yearning for a Silhouette Cameo for a long time! It would be incredible to win and share the joy with a fellow teacher! Would love to get one for me and one for my favorite teacher - my daughter who is a new special education teacher! I love your site, and would love to win this! I am a mom, wife, and teacher's aid right now and going to school full time to finish my own teaching degree. I could use this everyday! Thanks for the great ideas! Never used one and would be super excited to give one to the teachers at our school. I love Giveways!. Thanks for the opportunity to win, I have been looking at the Cameo for some time. I hope I get to win this time, I have been trying for a long time now. I have so many projects that I want to do. Awesome giveaway! So many ideas running in my head! I would love to win one of these and one for my son's kinder teacher! I have been wanting one of these for some time now and would love to win one. Plus with teacher appreciation week coming this would make an awesome gift for my daughters teacher. Yeah, so excited! Thank you for making this opportunity available! Whoever wins will be making a teacher happy! Great giveaway! thanks for the opportunity! Good luck everyone! If I win I'll share the second with a teacher who offers a free summer "camp" for disadvantaged kids in the area. She'll be over the moon! Forgot to let you know that I am following your blog via email, twitter, pinterest and google! I look forward to reading your posts! How generous! I know exactly which teacher I would share with! We live in a small community and getting extras like this for our schools is very difficult. Kathy-the wonderful teacher-would use the Cameo to help her students grasp math and science. I would teach her how they could make books or the students to keep as a reminder of the mostcaring teacher they will ever have! She spends so much of her own money to get the kids what they need to be successful in school. For me winning this would let me be able to continue crafting while my hand heals from surgery to repair 3 tendons and 2 nerves that I damaged when a window broke and sliced my wrist open! I had 18 stitches and misse the artery on both sides by mere millimeters. The hand surgeon told me that I may lose use of some or all off my fingers because the emergency room that I went to initially did not provide adequate treatment. I will not know if the surgery was successful for at least 6 weeks. There is still a chance that I will lose use of my hand. Thank you for a chance to win a tool that will allow me to continue doing something I love! To see photos of my injury check out my facebook page. How do I follow the blog. I think I am but there was no where to click on their blog to say I was following it and then what am I suppose to put on the line for the raffle thing once I follow it? This is such a lovely thought! Thank you so much for this giveaway! Wish I could win this!!! Would love to share with my BF who is an art teacher!!! I would love to give this to my sons English teacher- she really takes the time that other dont to try and get him back on track. She is on maternity leave but will be going back the last three weeks of school so she can be there for the kids when they take their finals. I'm thinking not only as a crafter, but as a teacher. HELLO!!! This is totally cool. Would love to share with my team but also with the art teacher! How generous....Thanks for sharing this give away!! Thanks for the chance to win! Super cute ideas! I am sure that a teacher would LOVE that gift. I know just the teacher I would gift this to! She is fabulous. And I would love to have one too! My daughter in law received one of these for Christmas, and loves it! My best friend home schools her kids and is great at is! She could use one of these so much in her day to day teaching and crafting! Thanks for the opportunity to win. Please pick me! I want to win this for me and my amazing favorite teacher my sister Amanda Wright. Amanda is one of those teachers parents fight to get their kids in her class. She spends so much of her own time and money on her class making it look good and making sure the kids have fun. She so deserves a silhouette! As for me I have had one on my wish list for at least 2 years. I look at all the designs and drool lol all the lovely pretties I can do if I only had this machine. Just a 2 quick questions - rafflecoptor not loading - suggestions? So fun! My daughter is not in school yet, but my step mom is a teacher and teaches a kids with various mental disabiliries. She would love this! This would be a great gift to giva a special eacher. She is finally starting her own Ladies Cave after kids moved out. Thanks for a great opprotunity. thanks a million for the chance!!! I have a dear friend who teaches in an at risk school... she needs all the assistance she can get! Thx for chance to win - my niece is just finishing up her first year as a kindergarten teacher - I will give her theSilhouette because I know she would LOVE IT!!!!!! Your link to the Silhouette website takes me to another blog instead. Am I doing something wrong? As a teacher myself, I would definitely have to our some of my coworkers names on paper and draw one!! Would LOVE this!!! I would love to win this . My daughter is a teacher in a small country school. She sure could use one. She spend a lot of her money on her children she do a after school art class once a month for the children. I love what I have seen done with the Camoe. Thank you for a chance to win. This is a great giveaway!!!! My daughters preschool teacher would LOVE this. I can't get the bundle link to work--any tips? Thanks! What an awesome giveaway! I was just looking at the silhouette portrait online today wishing and drooling ;) This is a great deal. I would love to win one and have another to give to our elementary school! Thanks! My favorite teacher is my daughter, her students really love her. Would also love to be able to use this for gifts and crafts with my 11 grandchildren. Thanks for the chance to enter! Please specify if the prize is for USA residents only or open to both Canada and USA or International. I go through everything to get to the end to finally find the raffle-copter to find the terms... and there in tiny print.... residents of USA only. It's quite annoying. Thanks for the awesome teacher gift ideas, and for the chance to win of course! =) My best friend is a preschool teacher, she would love, love, LOVE this. If I win she will be one happy teacher! I would love to have one of these for myself. I am a school bus driver and would love to donate one to my lower income school. Thanks for the giveaway! I would love this! I homeschool my kids, but I know a FABULOUS teacher that could really benefit from this! :) Thanks for the giveaway chance! I love the personalized gifts. They look fabulous. I'd love to have one of these and since I have Fibromyalgia and can't get out to do much, I'd be nice to have something I can do to keep me busy at home. There are a few great teachers here that are amazing with the kids, it would definitely go to go use. I hope I win, but good luck to all! Would love to have this for my work with disabled children and to give one to the teachers at my agency. crossing my fingers, I would love to give this awesome gift to my fav teacher! I have a friend who is an art teacher for 2 different elementary schools and an intermediate school she would love to have a cameo. She also volunteers for an animal rescue group and I'm sure it would come in handy for that also. Thanks for the contest. Wow nice giveaway you get to keep one and give one too! This is a generous giveaway, and if I won, it would be awesome to give one to my favorite teacher in the whole world -- a person very dear to my heart. Thank you! I'd love to win this! And as a former teacher, I have many teacher friends as well as teachers in the family. Both my kids have wonderful teachers too. I'd love to win one for me and one for another wonderful teacher! (Also, the last few ways to enter the contest weren't working a few minutes ago). my kids have great teachers. we would love one of these! My daughter loves arts and crafts! We always make gifts for her teachers! Never mind...I found the giveaway widget!! Love this giveaway!!! My daughter works for our public library system. She works at a library in the needest part of our city. I think this would help her and her fellow library assistants plan art and craft classes at the library. Thank you for this great opportunity. The rafflecopter wouldn't load. Hope I can enter this way? I would give the 2nd Sillouette to my sis who is just finishing up her very first year teaching! I know she would LOVE this!! Awesome giveaway! I likey.... I shared... and am so excited! I do in home daycare and would love love this. I would share the other with a sweet 1 st year teacher. We would both love this for their kids. Very nice giveaway. I found the rafflecopter-I was waiting for it to open in the post. I would love to win just one of these. My daughter home schools, works full time, is having a baby and going back to school soon. I have no idea how she does it, but I would love to give one of these to her. love a good give a way!!! This is a great way to bless some great teachers! It would be so hard to decide which teacher/school to bless! Thanks! Definitely shared this one on Facebook! I know my art teacher would love one and I could do all sort o projects in the school library. Is the rafflecopter working? I thought it was because I was using Chrome, so I switched to IE and it still is not visible. This would be amazing!! It would blow my mind to receive this and to be able to give one to my favorite teacher. As I said on. My Facebook post thank you for all of your fabulous ideas. Thanks for the opportunity. :-) This is AWESOME!!! What a fantastic giveaway! My youngest son has the most amazing teacher who always comes up with incredible arts and crafts to incorporate into class lessons. I would love to give her a Silhouette as a thank you for making school such a great learning environment for my son. I wondering does it have to be a school teacher what about daycare providers.....Love the giveaway!!! I would love to give this to my sons preschool teacher who is amazing and has taught her kiddos so much. What a great school-wide gift this would make! Bulletin boards, student displays and parent communication have all made such leaps forward lately- it's wonderful to see creativity take off again! Thanks for the chance to win these wonderful tools! This is a great contest!! I'd love a Cameo and how fun to get a chance to make a teacher very happy!! My best friend is a teacher and she's an avid crafter and scrapbooker. She would just luv this as well as I would too! What an amazing gift and opportunity, I know just which teacherIwouldg give it to! Thank you for this opportunity, I would love one of these!!!! I liked and shared on Facebook. Can't wait to see who wins! This would be awesome to play with. I know sooooo many teachers at my girls' school that would appreciate this and share with the other teachers. :) What a fun give away! we have an amazing art teacher at the school I work at. She is often buying supplies out of her own pocket. She doesn't even take her lunch with the rest of the teachers.She would rather be in her room having lunch with students, who just go there during lunch because they want to spend time with her. I would live to give this to a friend that is a teacher. She is always looking for new and exciting things in her classroom! I don't have school age children, but there are plenty of local schools in the area. I could give the Cameo to one of them for all of their great teachers to use! this is awesome! i would love one for myself and for my brother and sister-in-law who are both teachers!!! We homeschool and scrapbook and I would totally share with my sisters! My daughter has a teacher that is getting married. What a fun gift this would be. She would love this!! Thanks! This is amazing!!!! What an awesome way to show a teacher how much she is appreciated for all she does!!! Love it! Personally, I would have a blast with one over the summer as well. I know a teacher who would LOVE to have this for their classroom. 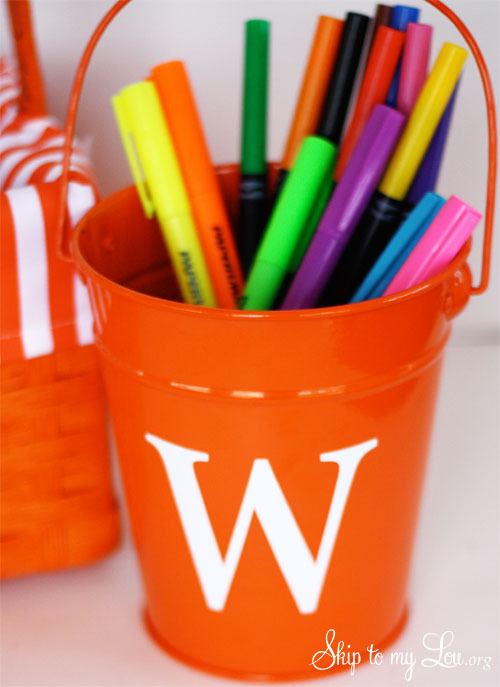 It looks perfect for cute organization in the classroom! My daughter goes to an art pre-school with absolutely wonderful, patient, and loving teachers. Their school could totally use a Cameo. Awesome give away!! My kids both go to a small Montessori school and they have the most wonderful art teacher- I would love to be able to give her a Cameo to play with over the summer! What a great giveaway! My kids have the same teacher for 3 years and she is wonderful! Kid #2 is in his last year with her but #2 is in her first & will have her for another 2 years so I would lLOVE to give her something superspecial!